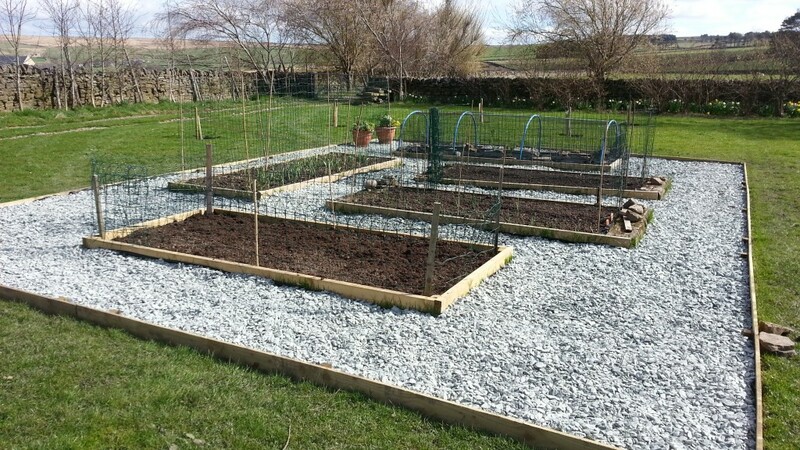 At last, construction of the new raised bed area can be considered complete! The final task of shifting 4 tonnes of slate chippings with a spade and wheelbarrow is finished. It took a little longer than I had originally expected but the results are exactly what I wanted. Raised beds – all done! For the moment the soft fruit bushes are taking up a raised bed on their own but they will probably not be there forever. 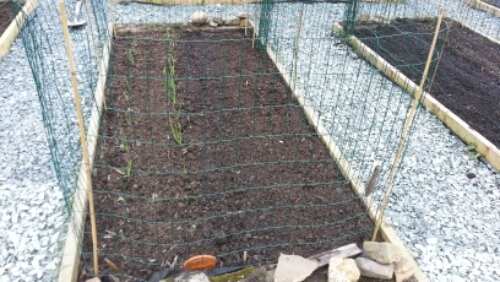 Another raised bed is already filled with garlic and onion sets that were planted last year and they seem to be doing well. The over spill of onions made a couple of rows in another raised bed and these have been joined by a quick row of carrots – the first sown direct outside. Hopefully this has been timed right to fit in with an earlier sowing using root trainers (as a test) so that the harvest can be spread out a little. It also means that all space in this bed has been allocated. 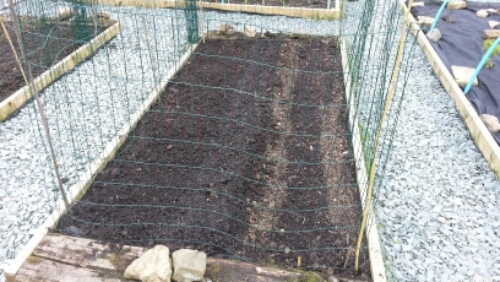 Although there’s not much to show for it yet, this bed has the first beetroot sowing and now a row of leeks sown direct as well. There is a batch of leeks that were sown in pots earlier and they are coming along nicely so this bed is also pretty much allocated as well. That leaves just the last raised bed to be filled which is completely empty at the moment but the plan is to use that for parsnips and swede. Last years attempts at parsnips were planted far too late in the year after out house move so nothing came of them. I’ve never tried growing swede before but it’s good to try new things and I’ll be interested to see how that goes!